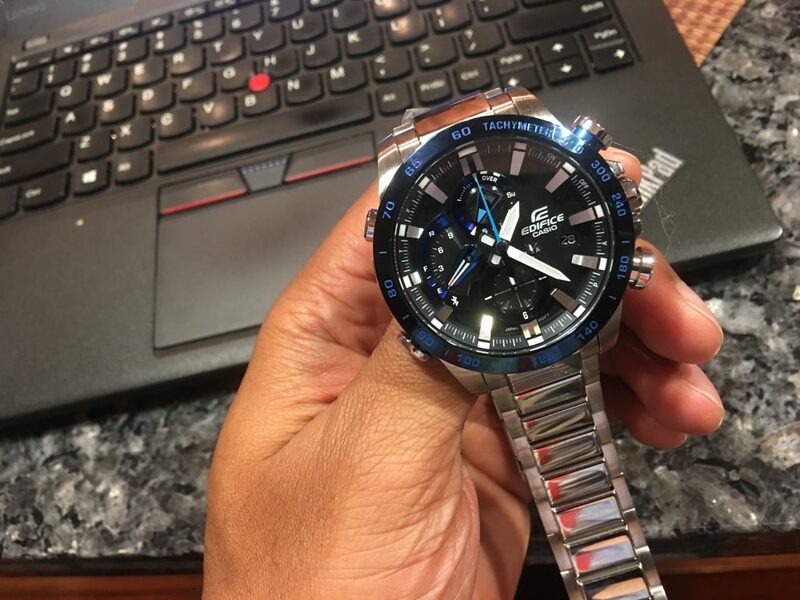 Reviewing the new Casio Edifice EQB800 Smart Watch. The newly released Casio Edifice EQB800 is the latest addition to Casio America’s line of smart watches. As smart watches continue to enter the market, the latest addition from Casio is an analog interpretation of the smart watch category. I happen to prefer the analog look and am happy Casio selected it for the latest release. A companion app is also available for the iPhone to fully take advantage of the Casio Edifice EQB800’s features. The design elements of the watch draw inspiration from motorsports and feature racing details. Team Casio was kind enough to offer this editor a piece to take for a test drive and get all handsy with it … and I did. 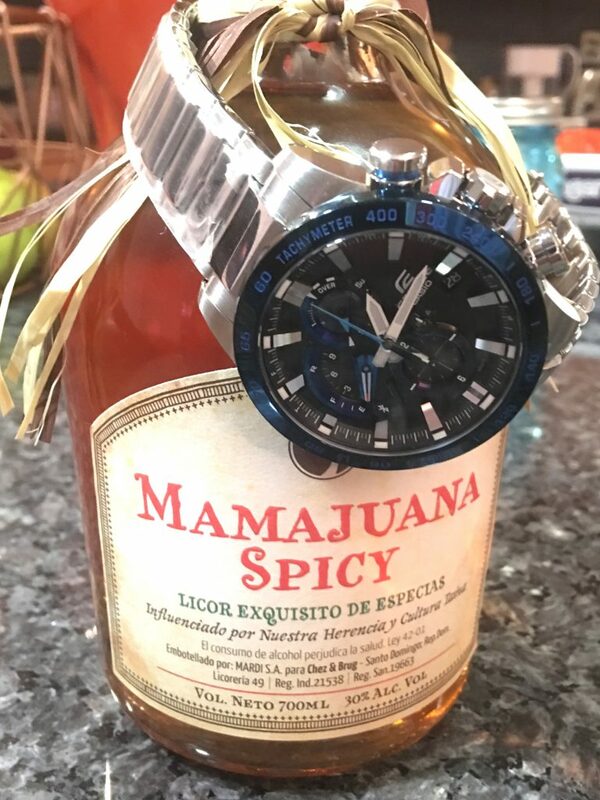 Upon receiving the watch, my initial impression was that this is a bold piece that takes up a nice presence on the wrist. This is due to the case size, measuring at 49.2 mm in stainless steel and the fact that it is on a bracelet. For those that like a certain heft to their watches, the Edifice EQB800 checks the box. As for the racing elements on the dial, a number of details drive the theme forward. The tachymeter bezel is done is a vibrant electric blue which is contrasted by a black dial. The dial also offers visual depth as it is sunken with sloped indices. In reading the layout, the white hands are highly legible, while the blue steeled second hand is a nice additional touch that pairs well with the bezel. There are three sub-dials on the dial. The sub-dail at the 12 o’clock position displays the active function on the watch. The options are alarm, stop watch or calendar. For calendar mode, the sub-dial indicates the day of the week. While the stop watch is activated, the register will indicate the difference in lap times. The register at the 9 o’clock indicates either the stop watch function or battery life. For the travele,r a second time zone is displayed at the 6 o’clock register. The piece has four pushers around the dial. The pusher at the 10 o’clock is used to select the mode of the watch, while the pusher at the 8 o’clock is used for time adjustments or a longer hold to activate the Bluetooth connection. The pushers at the 2 and 4 o’clock position are used for adjustments across the three modes of the watch. When linked with the iPhone app the full features of the watch are unlocked. Through the app, the user can adjust the second time zone, the alarm, and stopwatch functionality. The app will then log and keep track of the data. Additionally, the piece is able to locate your phone via the Bluetooth find phone function, which is a nice feature if you are like me and constantly lose your phone around the house. Some other practical innovations in the watch are that it updates the time four times a day to ensure it accuracy. 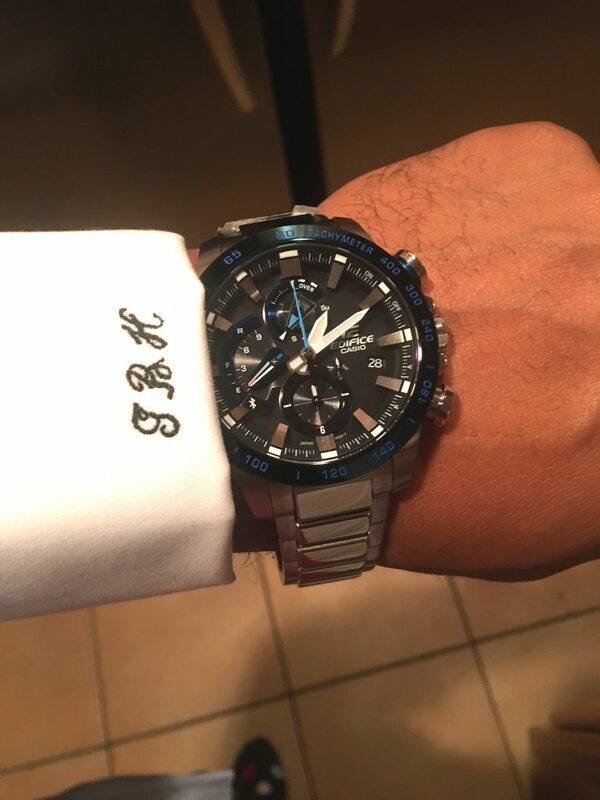 My overall impression of the Casio Edifice EQB800 is that it is a really fun and useful device. The ability to track lap times will strike a chord with any speed enthusiast, while the practicality of a dual time zone, and most importantly a phone finder, will appeal to the active traveler and person about town. Finally the ease of use of the Bluetooth iPhone app to interact with the watch makes the nuanced complexities extremely digestible. As watch prices continue to appreciate, the Casio Edifice offers a welcoming value proposition to the market at $350. The Casio Edifice EQB800 smart watch is a really fun watch at a great price of $350. making it a great holiday gift.